A DOG THAT was left in a hot car with windows closed in yesterday’s heat was found to be ‘in distress, uncomfortable and breathing heavily’. A spokesperson for DSPCA told TheJournal.ie that the small dog was discovered in a car in Dublin 4 with an empty bowl of water and no ventilation or shade. They said the dog was locked in the car with all the windows closed for an hour before the owner returned. The DSPCA added that further investigations are ongoing. People know that dogs should not be left in cars for even a few minutes in weather this hot, but other pets have to be taken into consideration on days like today. Finally, do not take your dog in the car if it can be avoided, even for a short journey. Even with the windows open it can be too hot and your pet will suffer. 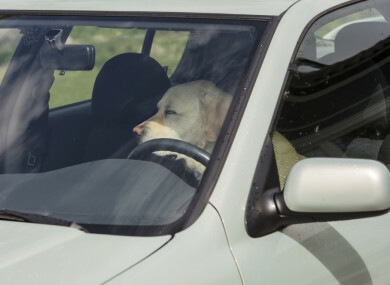 Email “Gardaí and DSPCA warn dog owners to be careful after dog left in hot car found 'in distress' ”. Feedback on “Gardaí and DSPCA warn dog owners to be careful after dog left in hot car found 'in distress' ”.